The persistence of generalists and specialists is a topical question in community ecology and results from both ecological and evolutionary processes. At fine taxonomical scales, ecological specialisation, i.e. organisms preferentially exploiting a subset of available habitats, is thought to be a driver promoting niche diversity. It is not clear, however, how different mechanisms interact to shape specialist-generalist coexistence. We reconstruct the structure of five bacteria-phage networks from soil isolates, and perform an analysis of the relationships between host phylogenetic diversity, parasite specialism, and parasite performance. We show that the co-occurrence of species on a continuum of specialism/generalism is influenced by niche overlap, phage impact on bacterial hosts, and host phylogenetic structure. In addition, using a null-model analysis we show that infection strategies of the phages have more explanatory power than bacterial defenses on key structural features of these antagonistic communities. We report that generalists have more impact on their hosts than specialists, even when the phylogenetic heterogeneity of hosts is controlled for. We discuss our results in the light of their implications for the evolution of biotic interactions. Ecological specialisation is one of the central features of ecological communities (Devictor et al. 2010;Forister et al. 2012;Poisot et al. 2011a;Ravigné et al. 2009). Theoretical work identifies three broad scenarios to explain the diversity of potential or actual competitors. First, fluctuating environments may maintain competing species that otherwise could not coexist (Abrams 2006a). Second, consumers may reduce interspecific competition through foraging behaviour (Abrams 2006b2006c), possibly correlated with active habitat choice (Nosil et al. 2006), numerical responses (Hochberg and Hawkins 1993) or the avoidance of sub-optimal hosts or environments (Heineman et al. 2008). Finally, diversity can emerge from certain trade-off structures associated with different niche exploitation strategies, although some degree of immigration from neighbouring patches is also necessary (Egas et al. 2004;Parvinen and Egas 2004). The common thread in all of these mechanisms is that diversity is promoted when specialists exploit different niches with respect to other specialists and to generalists (Patterson et al. 2003;Ricklefs 2010;Smith et al. 2008). Past theory assumes a relationship between specificity and overall performance, i.e., fitness or population size, resulting from, for example, trade-offs between competition and parasite infection (Greenman and Hoyle 2008). Specialists can persist if, when at low abundances their growth rates are positive in the presence of competitors, which is trivially the case when their resources are not exploited by other organisms (Poisot et al. 2011a). However, all else being equal, one would expect that species evolve to become generalists if associated costs are sufficiently low and in so doing they ecologically exclude more specialised species (Dennis et al. 2011;Loxdale et al. 2011). To explain the existence of highly specialised parasites, Poulin (1998) proposed the “trade-off hypothesis” (TOH), which states that a species (such as a predator or parasite) exploiting multiple victims (prey or hosts) is more likely to encounter a range of different defence systems and, because of the costs in overcoming each, cannot be optimally adapted to all victim types. This would result in generalists being less competitive than specialists for each resource exploited, but because generalists exploit many resources they are able to coexist with specialists through across-environment (hosts) compensation. An alternative to this is Brown’s “resource breadth hypothesis” (RBH), where species with wider niches can achieve greater overall performances and are able to outcompete specialists in some habitats (Brown 1984). This latter hypothesis predicts that specialists will be competitively eliminated unless there is some form of niche differentiation, specifically if specialists have niches that do not overlap with the niche(s) of more generalist species. Empirical evidence is consistent in some cases with RBH (Krasnov et al. 2004) and in others with TOH (Poulin 1998). Other studies report no correlation between specificity and performance (Morand and Guégan 2000), meaning that patterns of niche exploitation and differentiation do not correlate with how well species perform in their environments. The objective of the present study is to identify the structure of antagonistic bipartite networks sampled in the field and to employ these to determine which key properties are involved in maintaining ecological diversity in these systems. The “species” in our field study are isolates of lytic bacteriophages infecting isolates of the rhizosphere bacterium Pseudomonas fluorescens. Bacteria-phage networks have advantages over other biological systems. First, they can readily provide well resolved data on performance and specificity, and thus niche breadth and overlap (Flores et al. 2011;Weitz et al. 2013). Second, they are easily sampled, and given the small spatial scales over which they typically occur (Vos et al. 2009), can be resampled to assess replicability (Koskella and Meaden 2013). Third, the strength of pairwise interactions, also called “link strengths” (Berlow et al. 2004), can easily be estimated using virulence assays, such as the negative impact of introducing a phage isolate on the population of a bacterial isolate. 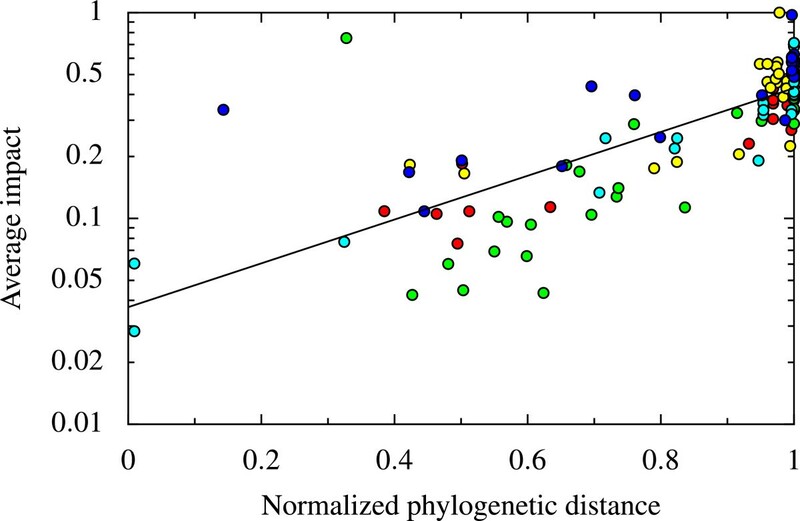 Finally, robust phylogenetic markers are available for P. fluorescens that enable assessment of how link strength relates to host phylogenetic diversity. This allows controlling for evolutionary inertia in defence strategies that can bias the estimate of enemy performance across its victims. This is important because the overall impact of some phages may be over-estimated if they exploit a group of phylogenetically related hosts. We sampled five networks of P. fluorescens and its lytic phages along a transect in a natural environment (soil) and show that, contrary to the assumptions of TOH (which assumes increasing performance on the exploited niches with increased specificity), the link strengths of phages on their hosts increased with phage generality. Specialists were found to have well differentiated biotic niches, suggesting this may be a mechanism for their community persistence with generalists, thus increasing the overall diversity of host exploitation strategies. These trends were consistent across the five networks and support the idea that costs associated with the different strategies may not be the most relevant explanatory variable for interaction web and community structure in certain systems (Asplen et al. 2012;Fry 1996;Poisot et al. 2011a). We discuss the relevance of our results to the persistence of diversity of biotic niches in antagonistic associations. where N is the optical density (OD) of bacteria at 0 h and at 24 h post–phage introduction, and i and j are respectively bacteria and phage isolates. N i refers to readings made of bacteria in the absence of phage, and all measures were corrected for the OD of the medium without the bacterial inoculum. Positive values of M indicate that the phage has a negative impact on the bacterium (presence of a link) and higher values of M indicate a stronger impact. Note that our estimate of M is for a single interval, and we expect that it would vary through time after phage introduction. Quantifying the temporal dynamics of phage impact and untangling the underlying ecological and evolutionary causal mechanisms could yield interesting insights but is beyond the scope of the present study. The resolution of our OD measures (Uitz et al. 2010;Zwietering et al. 1990) permits the detection of weak links, which is not always possible in other types of association, namely those that depend upon field sampling or the direct observation of rare interactions (Goldwasser and Roughgarden 1997;Olesen and Jordano 2002). Our bacteria-phage networks can be accessed online (http://dx.doi.org/10.6084/m9.figshare.696102). R j = V - v j V - 1 . This latter index is a modification of measures of species degree or generality (Schoener 1989), such that a generalist species (establishing links with all bacterial isolates) has R = 0 and a specialist (establishing a single link) has R = 1. Note that for both RR and PDI a value of 1 reflects maximum specialisation. Both of these measures consider specificity on a continuum, i.e. do not discretely separate parasites into specialists (single host) and generalists (two hosts and more). which is the proportion of the total reduction in Malthusian fitness of bacteria i by phage a (the same calculation applies for Ω bi ). C a = ∑ C aj ∀ a ≠ j . In addition to these measures, we define the average link strength of each phage as the mean of all the links it establishes (i.e. the mean of all P > 0). The highest performance of each phage is given by max(P). We calculated the nestedness of our networks using the Nestedness based on Overlap and Decreasing Fill (NODF) index because of its consistency and robustness (Almeida-Neto et al. 2008). NODF measures the extent to which species exploit a subset of the hosts exploited by another, more generalist species; an NODF value of 1 means that the matrix is perfectly nested and a value of 0 means that it is entirely anti-nested. To check for the existence of modules (i.e. clusters of species that interact more among themselves than with other species, compared to a random expectation) we applied the LP-BRIM algorithm (Liu and Murata 2010), which optimises Qbip, Barber’s bipartite modularity (Barber 2007). To evaluate the reliability of the network partitions found by LP-BRIM, we measured what we call ‘realised modularity’ (QR), i.e. the proportion of links established between species sharing a module. Values of QR close to 0.5 mean that an equal number of links are established within and between modules, and thus the division of the network into modules is not meaningful; values closer to 1 indicate the links are all established between species sharing the same module, and thus modularity is more important to network structure. In addition to nestedness and modularity, we measured network connectance, i.e. the proportion of potential links that are realised, as it relates to the resistance/infectivity ranges of the bacteria and phage. Values close to 1 indicate that all possible interactions occur and values approaching 0 indicate few interactions. To assess the significance of these patterns, we apply four null models, each intended to separate the impact of phage and bacterial strategies on the network-level metrics (Additional file 1). Each bacterial isolate was cultivated in 6 mL KB at 28°C for 24 h in 15 mL cylindrical plastic microcosms under constant shaking at 130 rpm and then plated on KB-agar at 28°C and grown for 48 h. DNA was extracted from one arbitrarily chosen colony by diluting it in 150 μl of sterilised water at 95°C for 5 min and then storing it on ice. Three polymorphic housekeeping genes were used in our analysis: dsbA, recA and fusA. These genes were chosen from among the 10 markers used by Frapolli and colleagues (Frapolli et al. 2007), since these three markers displayed the highest number of polymorphic sites and therefore allowed the reconstruction of a phylogeny with a good resolution. The detailed protocol used for amplification is described elsewhere (Frapolli et al. 2007). Briefly, PCRs were performed using the following cycles: initial denaturation at 94°C (150 s) followed by 30 PCR cycles (94°C for 30 s, 55°C for 30 s and 72°C for 60 s) and a final extension at 72°C (10 min). The size of the PCR product was checked by electrophoresis on a 1% agarose gel. PCR products (amplicons) were purified and sequenced by GATC Biotech. Sequences were BLASTed against GenBank using blastx to ensure that they matched reference sequences of P. fluorescens. Sequences were deposited in GenBank under numbers JX139951–JX140023 (dsbA), JX140024–JX140114 (fusA) and JX140115–JX140190 (recA). Alignment of DNA sequences was performed using ClustalW 2.0 (Higgins et al. 1996;Thompson et al. 1994) and manually curated before phylogenetic reconstruction. Maximum likelihood trees were inferred for each gene with PHYML v. 3.0.1 (Guindon and Gascuel 2003). The evolutionary model best fitting the data from DNA alignments was obtained using the phyml.test function for R 2.13.0 in ape (Paradis et al. 2004) and selected based on their Akaike Information Criterion (AIC) score. The supertree (combination of the optimal trees obtained from the analysis of individual genes) of the three genes was performed using Clann v. 3.0.0 (Creevey and McInerney 2005). These methods take into account across-gene heterogeneity in evolutionary rates by using partitioned-likelihood models, which allow each gene to evolve under a different model. Phylogenetic diversity of the bacterial isolates was measured using the PD index (Faith 1992) of all bacterial isolates infected by a given phage isolate (based on the distance within the supertree). The PDs of each phage were standardised by the largest and smallest distances in the bacterial local phylogeny, so that the phylogenetic distance across bacteria was in the interval [0,1] within each sampled patch. This corrects for the fact that some sites had slightly lower bacterial phylogenetic diversity. The five networks (displayed in Additional file 2) were all highly connected (0.76 ± 0.10) and highly nested (0.80 ± 2.07) compared to random expectations, and all displayed similar structure. Additionally, using four different null models (Appendix 1), we rejected the hypothesis of random nestedness. Contrary to a previous study (Flores et al. 2011), we used a more conservative approach which accounts for the number of links established by each species (and not just the number of links in the whole network). We found a significantly higher modularity than the random expectation, which was principally due to phages (see Additional file 1). For all networks and the system as a whole, we observed a continuum of both specificity of associations and impacts (Figure 1), which indicates that contrasting host exploitation strategies (i.e. integrating the number of host isolates, the impact achieved on each, and phylogenetic relatedness between hosts) co-occur within our communities. The values of host range, resistance and nestedness in each of the five networks were close to previous experimental findings obtained through plaquing assays (Poullain et al. 2008). There was a strong positive relationship between specificity measured as the number of bacteria upon which phages have a net negative effect and specificity measured as the differences in the intensity of negative effects, indicating that enemies with large victim-ranges tend to impact their different victims more equally than enemies with small ranges. Hereafter, we focus on specificity of impacts (i.e. skew in performances across affected victims isolates). 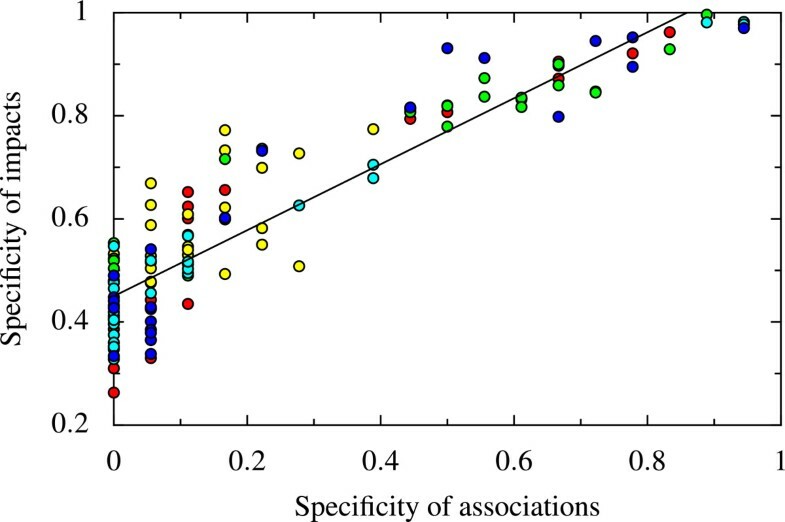 Relationship between the specificity of associations (as measured by RR, reflecting the proportion of available hosts exploited) and the specificity of impacts (measured by PDI, reflecting differential impact on available hosts). Both aspects of specificity are positively correlated (correlation coefficient r = 0.91, p < 10- 5, R2 = 0.84). As for all figures, the colour of points indicates network identity. Red: 0 cm, Blue: 1 cm, Green: 6 cm, Light blue: 16 cm, Yellow: 30 cm from the start of the gradient. We found a strong negative relationship between specificity and mean link strength (Figure 2a). The same relationship was found between specificity and the strongest link of each phage (Figure 2b), indicating that highly specialised enemies do not have larger impacts on their ‘optimal’ victims than do generalised enemies. To account for the fact that phage impact may be similar on genetically related bacteria (one main tenet of TOH), we used the normalised mean phylogenetic distance between all victims impacted by a given phage as a measure of this phage generality. We observed that generalist phages (i.e. those with greater phylogenetic distances between their victims) also had stronger impacts than relatively specialised phages (i.e. those exploiting more phylogenetically related victims; Figure 3). Relationships between specificity and average and highest impact. 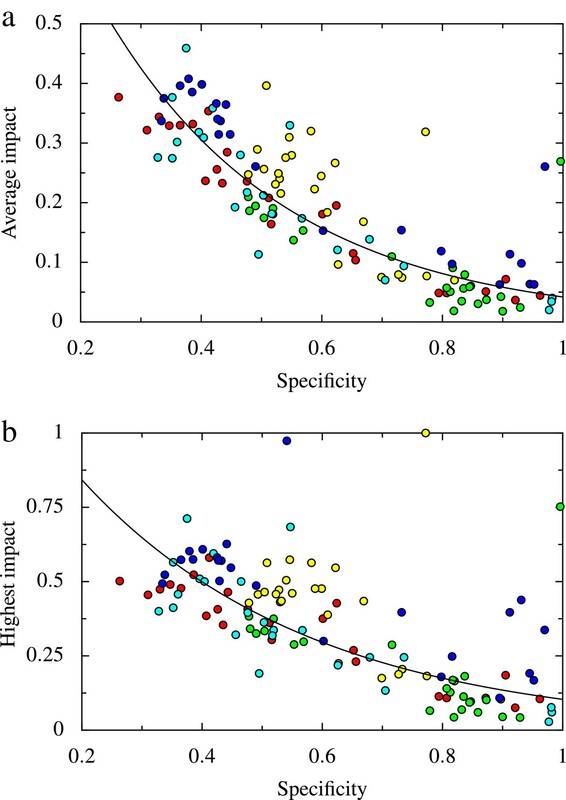 (a) Negative relationship between specificity and average impact over all exploited hosts (r = -0.81, p < 10- 5, R2 = 0.71; similar results were obtained for cumulative impact). (b) Negative relationship between specificity and higher impact (phage-wise) across all exploited hosts (r = -0.66, p < 10-5, R2 = 0.68). These results indicate that more specialised phages have lower impacts than generalists even for the host on which they are more adapted. 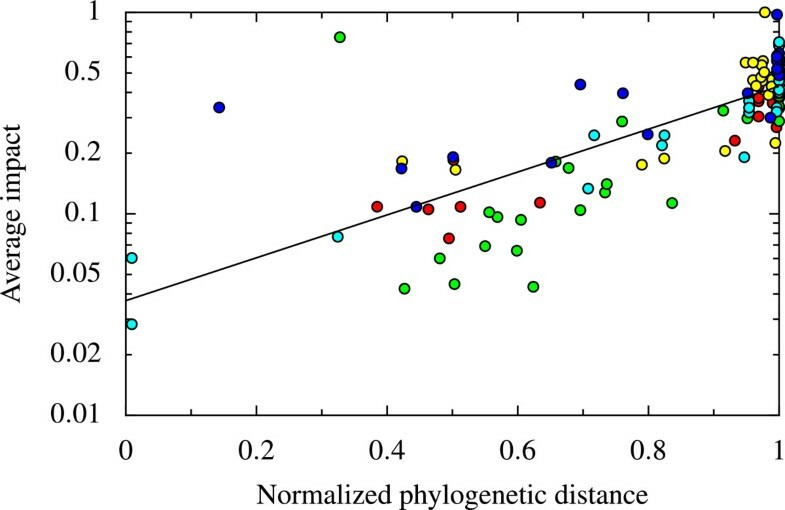 Positive relationship between phylogenetic distance between hosts and average impact (viewed on a decimal-log scale; r = 0.77, p < 10 -5 , R 2 = 0.61). Phages that are able to attack more phylogenetically distant host isolates also have a greater impact on these hosts. Finally, we found a negative relationship between niche overlap and specificity, with more specialised phages tending to exhibit lower overlap (Figure 4). 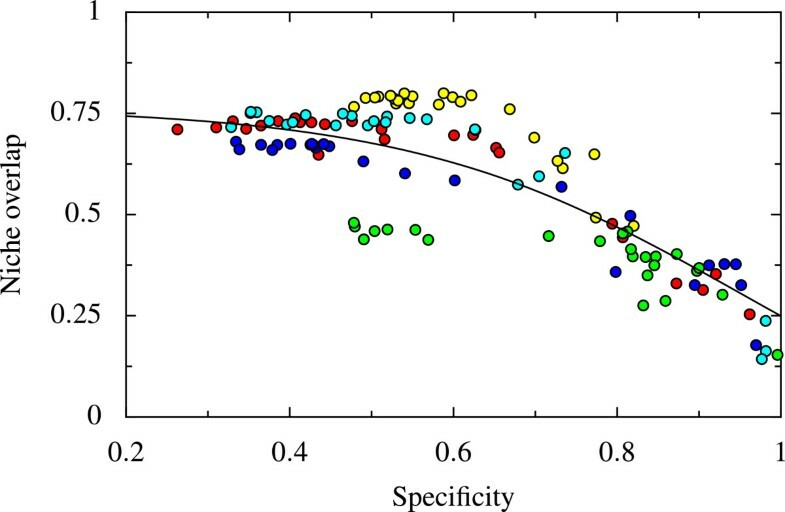 We saw that niche overlap was relatively insensitive to specificity at low levels of the latter and strongly decreased for sufficiently high levels of specificity. While the overall trend of this relationship was similar across sites, the inflection point and plateau level were both distinctly different for Network 3. Note that Network 3 was less connected and appeared to also be more modular than the others (Table 1). This may account for the relatively lower observed niche overlap values (Figure 4) and reinforces the importance of replicating networks across time or space. Negative relationship between specificity and niche overlap ( r = -0.81, p < 10 -5 , R 2 = 0.74). This figure suggests that the most specialised phages compete less with other isolates. Values for species-level metrics are mean ± standard deviation. Nestednesses (as measured by NODF) were higher than expected when tested against four null models (see Additional file 1). Generality (infection) and vulnerability (1 - resistance) are given as the proportions of the total number of bacteria exploited and associated exploiting phages respectively. Qbip and m are respectively Barber’s bipartite modularity score and the number of identified modules using LP-BRIM (see the ‘Methods’ section). QR is ‘realised’ modularity (Poisot 2013), i.e. the proportion of links occurring between species sharing a module (values close to 0.5 indicate that half of the links are established by isolates from different modules). Generalism is predicted to be costly both ecologically through the necessity of finding suitable habitats or hosts (Devictor et al. 2010;Poisot et al. 2011a) and evolutionarily due to tradeoffs with other fitness-determining traits (Bakke et al. 2002;Egas et al. 2004;Ravigné et al. 2009). The existence of such costs comes from studies of different antagonistic systems, including parasites of fishes (De Meeûs et al. 1995), birds (Fry 1990) and bacteria (Poullain et al. 2008), and of non-antagonistic systems such as pollinators (Waser et al. 1996). Based on field samples, we report that bacteriophage specialism is associated with decreased impact on bacterial isolates, both on a per-bacterium isolate and a cumulative basis. Assuming that the net impact of phages on a host is related positively to the former’s fitness (Gandon and Day 2009), this suggests that specialism is costly in these bacteriophages. Recent findings on species adapting to abiotic conditions (Boulangeat et al. 2012) indicate the same trend, namely that based on measures of performance (e.g. abundance, growth rate), specialism appears to be costly or to reflect maladaptation. The negative correlation we identified between specificity and performance could emerge if more generalised enemies exploit a larger number of closely related victims than do specialists; even if generalists and specialists have similar impacts on a given isolate, pseudo-replication due to phylogenetic similarity would inflate the cumulative impact of generalists compared to specialists (Cavender-Bares et al. 2009). When using the mean phylogenetic distance between hosts as a measure of specificity, we found that, for all five networks, phages had stronger impacts when exploiting the most phylogenetically dispersed bacteria (Figure 3). This indicates that, in these situations, phages tend to have stronger links with each bacterial isolate, in apparent contradiction with the predictions of the trade-off hypothesis (Poulin 1998). This result reinforces the idea that phylogenetic diversity at both trophic levels can have far-reaching consequences on the distribution, breadth and overlap of species’ biotic niches (Mouquet et al. 2012). This calls for a more explicit integration of how phylogenetic structure drives interactions in network studies (Eklof et al. 2011), which will require sequencing both neutrally evolving and functional markers involved in the interaction. Interestingly, we observed that specialism estimates are distributed along a continuum in all five networks (Figure 1), suggesting that numerous phages with different specificities may coexist. This continuum (as opposed to the persistence of only specialists or only generalists) can be explained by the observation that specialist phages tend to show less niche overlap than do generalists, suggesting decreased competition involving the former (Schoener 1974). This could explain both specialist-specialist and specialist-generalist coexistence, despite the apparent advantage of generalists in competition. Specialist phages could represent genotypes having recently immigrated from neighbouring patches (Nuismer et al. 2003) and in the process of adapting locally to environmental conditions, thus displaying lower performance. This scenario is consistent with recent data on bacteria-phage systems in natural environments (e.g. Gomez and Buckling 2011;Koskella et al. 2011;Vos et al. 2009). Were this the only factor involved, we would nonetheless expect the presence of locally adapted, high fitness specialist phages; although rare, we did identify such isolates in our samples (see the outliers in Figure 2a,b). We do not, however, know to what extent generalist phages may have originated from specialist niche extension onto different host isolates, as suggested by recent genomic data on bacteria-phage coevolution (Hall et al. 20102011;Scanlan et al. 2011). Under this scenario evolution proceeds in two steps, with specialists first acquiring new hosts at a fitness cost which is ultimately alleviated by the spread of compensatory mutations (Agudelo-Romero et al. 2008). The endpoint of this evolutionary history would be generalist phages with no apparent fitness cost, which is consistent with our observations. These and our results are in agreement with phylogenetic analyses concluding that transitions from specialists to generalists are much more common than the reverse (Forister et al. 2012;Stireman 2005). The reduction of costs associated with generalisation through compensatory mutations provides both a mechanism for these previous results, and an explanation for the patterns we report. An important result of our study is that specialist phages tend to exploit distinct sets of bacteria (Figure 4). This indicates that these specialists compete relatively little with other phages, which could explain their persistence even if generalists have greater impacts (and potentially higher relative fitnesses) on their victims. Such a network structure could arise, for example, if each specialist phage has specific adaptations to exploit a single, otherwise resistant bacterial type. Our results suggest that specialists may exhibit a trade-off between competitive ability and victim impact, which would allow these phages to out-compete generalists or other specialists on a limited spectrum of victims. The view that costs associated with generality are a major driver of coexistence may not be true when complex interactions between genes or genomic regions exist (Remold 2012). In some complex systems found in nature, other factors (mostly ecological) may also have stronger impacts than trade-offs (Asplen et al. 2012). Our study is limited in its implications on this point, since assays were performed under controlled laboratory conditions. However, in support of this point, a previous experiment on the same system employed in the present study showed that network structure undergoes significant changes when the only modified variable is environment quality (Poisot et al. 2011b). Future work should investigate processes explaining coexistence in the field. Specifically, there is the possibility that costs associated with either defence or infection are expressed on a per-interaction basis, in which case the heterogeneity of costs across the range of enemies/victims can be a potent driver of specialist-generalist co-occurrence. Our results have implications for the evolution of bipartite network structure (Weitz et al. 2013). Recent results indicate that specialism can be one of the main drivers in the evolution of network modularity (Espinosa-Soto and Wagner 2010). Our results are consistent with this observation, since specialists were found to exploit a set of distinct niches (i.e., bacterium isolates). Additionally, phages, and not bacteria, are responsible for most of the modular structure observed (Additional file 1). The existence of modules in bacteria-phage networks has been shown at large taxonomic scales (Flores et al. 2011) and is considered to result from adaptive constraints to multiple infection pathways. Based on this and on our own findings, we suggest that specialisation that results in reduced competition with other exploiters leads to modularity in bacteria-phage bipartite networks at finer taxonomical scales. From a methodological standpoint we bring new elements to the debate about how modularity should be measured. It is striking from our results that all networks are more modular than expected (as reflected by Qbip), whereas most of them actually have fewer links established than expected between species sharing a module. QR thus appears to be a better index for estimating the statistical and ecological significance of a modular pattern. 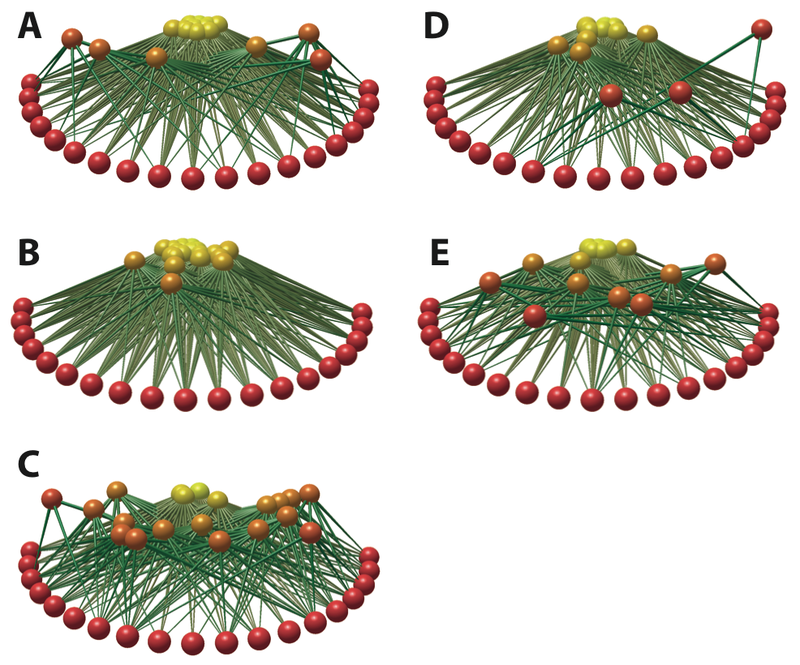 By crossing different null models, it is possible to assess which organisms (bacteria or phages) are involved in the emergence of network structure. This will bring new interesting results to the study of complex microbial systems. Timothée Poisot, Manon Lounnas contributed equally to this work. We thank Jennifer Dunne for providing us with a copy of Network3D, Sonia Kéfi and Dominique Gravel for discussions and comments on the results, Claire Gougat-Barbera for help with the molecular biology experiments, and Joshua S. Weitz and Cesar Flores for discussions about bacteria-phage networks. TP thanks the Canadian Research Chair on Continental Ecosystems Ecology for computational support. MEH thanks the Agence National de la Recherche Scientifique [EvolStress (ANR-09-BLAN-099-01)] and the McDonnell Foundation (JSMF 220020294/SCS-Research Award) for financial support. TP is funded by a PBEEE-MELS post-doctoral fellowship. TP, ML and MEH designed the experiment, ML conducted the experiment, TP and ML analyzed the data, TP drafted the manuscript, all authors contributed to revisions. All authors read and approved the final manuscript.